The Bend and Central Oregon real estate markets surged again in the the last year. 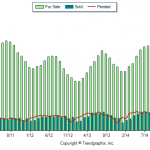 Across all genres of the market we saw lower days-on-market, higher price per square foot, and lower inventories for sale when compared to recent years. As real estate brokers, we spent a lot of time explaining to new buyers that those fantastic deals they hear their friends talk about, have largely become a relic of the past…for now. Buyers have responded to the financial pressures to make their Central Oregon relocation now. Historically low-interest rates, we’ve all been told, will soon start slipping away. That escalation in monthly interest payment combined with the constant rise in Central Oregon real estate prices, put a time limit on most buyers. Bend led the charge with higher buyer demand than we’ve seen in many years. Neighborhoods like Tetherow and Northwest Crossing have only picked up momentum and builders are struggling to keep up with the buyer demand for new houses. New home demand has put pressure on land prices as Bend starts to struggle against its own Urban Growth Boundary. Custom home builders have benefited from buyers picking up “in-fill” lots and building new homes in established neighborhoods. 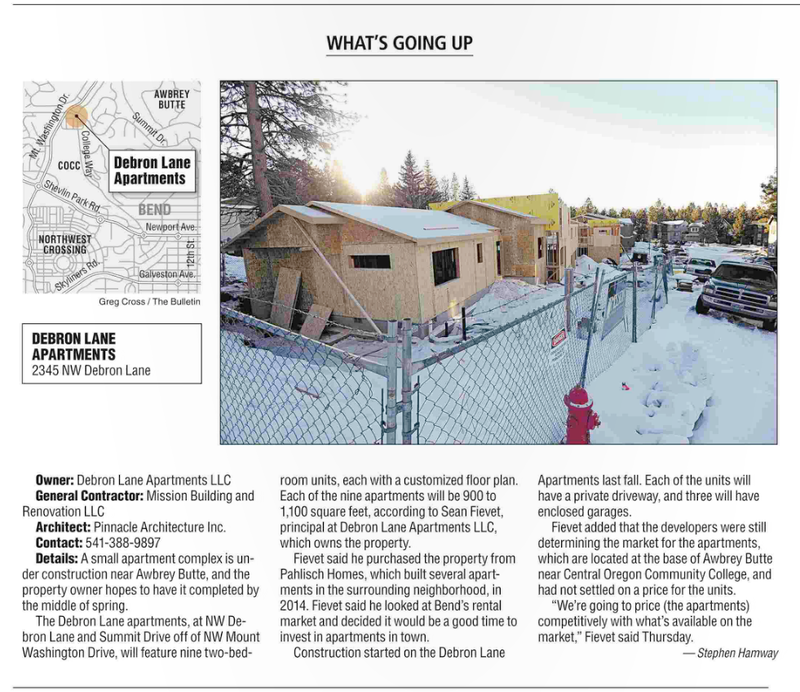 Buyers continues to assign a large premium to locations west of the Deschutes River, and developers wanting to capture that premium are pushing for more westside development. Watch neighborhoods like The Tree Farm (outside of the City Limits), Discovery Park, the unpublished Northwest Crossing Phase II, and the new Three Pines Ridge (located between Three Pines and Shevlin Ridge). The new Oregon State University campus, currently under construction, won’t do anything to slow this push of the city’s physical and financial epicenters to the west. For all of the complaints that have been lodged against its construction, the new four-year university will be a popular amenity for area developers to take advantage of. 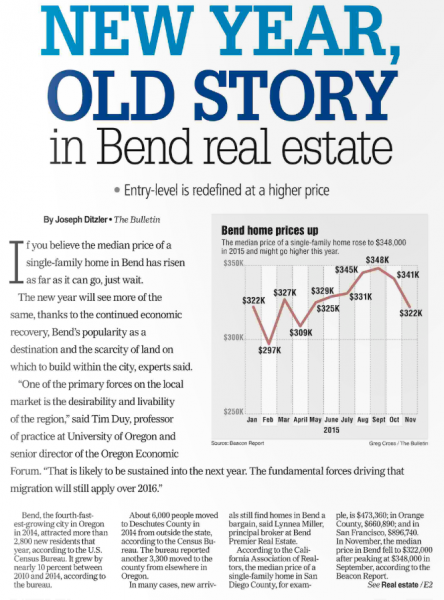 In a pattern reminiscent of the last boom cycle in Central Oregon, the strong demand and higher prices started in Bend, and now radiate out to surrounding communities in a slow tsunami. The patterns of lower inventory, higher prices, and shorter market times are moving through Redmond, La Pine, Sisters, and Prineville. Some buyers think that the best strategy right now is to wait. The assumption is that a major price correction like what we saw in 2008 is just around the corner, and will be a better time to pick up a property. But we don’t think history is on their side. For sure there is always a downturn in the market looming in the future, but to what extent that downturn drives down prices is very material. We have to remember that the collapse we saw in 2008 was an anomaly. Experts had to look back 80 years to find parallels in the Great Depression. And in the meantime, the costs of waiting, in form of mortgage interest rates and rental prices, continue to put pressure on the decision. *The one exception the rising markets seems to be Sunriver. We may have to study this further, but Sunriver’s market charts largely seem flat. A confused seasonal surge every year, but not a real upward movement that you can readily discern. Additional Dwelling Units (ADUs), or “granny flats”, could be part of the solution for Bend, Oregon’s housing affordability. They’ve become a popular investment for many homeowners in the area, but the City Council may be taking steps to make them even more so. The current ADU rules allow you to build an additional residence on your property up to 600 sf (some restrictions apply). You’ll need to provide an additional parking space for your new dwelling, and if your lot was created prior to 1998, you’ll need to go through a public conditional-use permitting process. This costs homeowners a minimum of $2,600, plus the time and effort of the application and required public meeting. – No conditional use permit required in most residential areas. – Increasing the maximum size of an ADU to 800 sf. – Removing the requirement for additional parking. Prior to the City of Bend imposing restrictions on vacation rentals, ADUs were a popular option for homeowners looking to earn some additional income by taking in travelers. The new ordinances severely limit most homeowners ability to enjoy the revenue they once could from the tourist market, which was, in most cases, many times what they could earn renting property out on long-term leases. However, with the ever-increasing trends of aging in place and multi-generational households, the ADU continues to be a popular addition. From the City’s standpoint, Additional Dwelling Units provide much needed rental inventories, increased density, and utilizes already existing infrastructure while making room for new growth. ADUs also bring affordable housing into neighborhoods which may no longer be affordable to most homebuyers. This is in contrast to the affordable-housing solutions from most developers that cluster entry-level housing on the periphery of the City where land is cheapest. 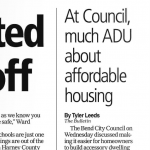 Bend isn’t the only city in Bend that thinks ADUs might offer many solutions. The City of Portland was an early adopter of new relaxed standards on ADUs when it came to their land-use process. Like Bend, Portland was suffering from the same dramatic increases in home prices that Oregon’s land-use laws can create in a rapidly growing city. Empowering homeowners to easily add new residences into their own neighborhoods was seen as a smart move. Adding a rental property to your current residence can come with some tax advantages (please consult your tax professional), but many people forget that it will also likely increase their property taxes. Because Oregon has limited property tax increases under normal circumstances (Measure 50), adding an additional residence to your property can have somewhat surprising tax results. In the Bend area, we recommend talking to the folks at Deschutes County Tax Assessors Office prior to finalizing any plans for an ADU. The staff there is helpful in explaining most property tax concerns, and their advice may direct the type of ADU you ultimately decide on. The Bulletin ran an article today looking at the median price of a home in Bend and quoting predictions of prices continuing to rise despite the recent dip. In the Bulletin on Saturday was this article regarding new apartments going up near COCC. The article talks about Pahlisch Homes having built several apartments in the area and this sounds like just an extension of those efforts. The truth is that Pahlisch Homes built townhomes and single-family residences here. It will be interesting to see what effects this has on the homeowners that purchased these earlier properties. Perhaps there was some disclosure made prior to the purchase for these folks, but we’ve shown those properties to prospective purchasers several times and it didn’t come up in our conversations with the brokers at that time. As we move out of the holidays, this is the perfect time to start planning to put your home on the market. Just after New Years Day, buyers start watching HGTV and begin to daydream about their next home.The problem is this is many months before most sellers are even going to start thinking about putting their home on the market. This is to the distinct advantage of sellers that get started early. It truly is the early bird that gets the worm. For the seller that’s going to be ready for the market by the end of January, now is the perfect time to start planning the event. 1. Get a pre-inspection – Many sellers don’t want to know what might be wrong with their house, but, the fact is, someone is likely to notice before you get to the closing table. In today’s market, buyers are very informed, and they know the value of having a property professionally inspected. Get ahead of the game, and hire your own inspector. Having repairs made when you’re not in the crunched time-frame of a sale is easier, and often cheaper. That pre-inspection will also give buyers peace of mind when they’re viewing your home. 2. Repairs and deferred maintenance – Take care of repairs and deferred maintenance. If you an afford it, taking care of items like a worn roof, stained carpet, and deteriorated siding before your house goes on the market is the best strategy. Buyers see signs of deferred maintenance and disrepair as a sign that the owner doesn’t care about the property. Buyers multiply what they can see many times over as they try to estimate what they can’t see. The bottom line is taking care of these items ahead of time, can result in much stronger offers coming from potential buyers. 3. Declutter – We can’t stress this enough. Get (almost) everything out of your house. The most important thing about staging a home to sell if having very little in the home. Remove personal items (photos, trophies, and memorabilia), clear out the closets, and plan on moving a third of your furnishings out of the house. If you don’t have a storage place offset, consider moving your items in the garage. The garage is the one room in the house that can be filled without detracting from the presentation of the property. The rest of the house should look open, spacious, and simple. 4. Clean – Sellers need to remember that prospective buyers are entering their home with a critical eye. They are looking clues to tell them how well the property has been cared for. In order to create the best presentation possible, your home should be cleaned to within an inch of it’s life. Not the kind of cleaning that you might have performed every week or so, but a true deep cleaning where every evidence of dust is eradicated from the residence. 5. Paint – Many sellers contemplate property improvements prior to marketing their homes. In general, most are not a good use of time or money. Second guessing what a potential purchaser is going to value is very difficult, and then expecting to recapture 100% of the costs is not reasonable. If there is one category that might be an exception to this rule, it would be simple painting. After you’ve taken care of the true differed maintenance and repairs, a fresh coat of neutral paint goes a long way in the marketing of your home. 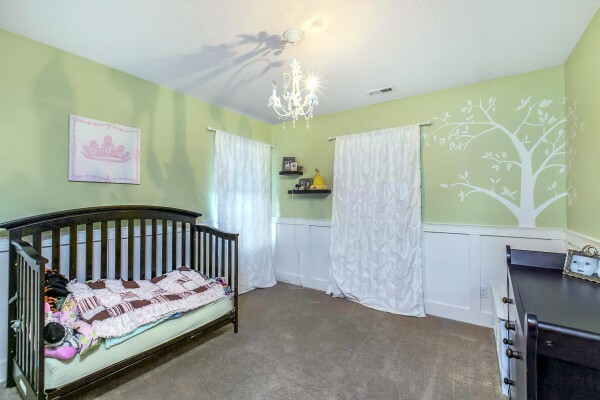 Fresh paint looks good, covers minor blemishes, and reminds the buyers that it’ll be several years before they have to deal with repainting. Smart sellers use the cycles of real estate to give themselves the best chance of selling for their expectations. 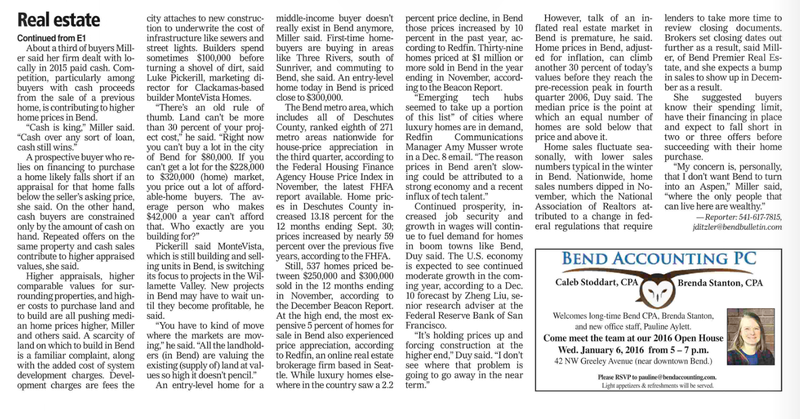 The real estate market is very seasonal in Bend and Central Oregon. 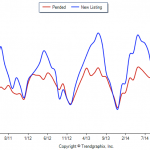 The sellers’ cycle is usually characterized by a peak of active inventory in the months of July and August. This coincides with the peak of green lawns, blooming flowers, and the completion of outdoor property improvement projects. As the leaves start to turn and snow is in the forecast, unsuccessful sellers pull their properties from the market and vow to return in the spring. 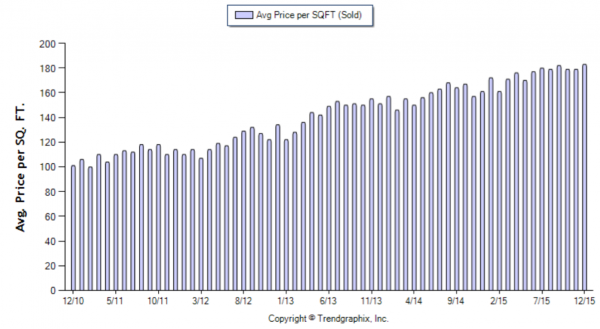 The problem is this: this trend doesn’t exactly match up with the buyer demand trend. Buyers are not quite as driven by warm temperatures. 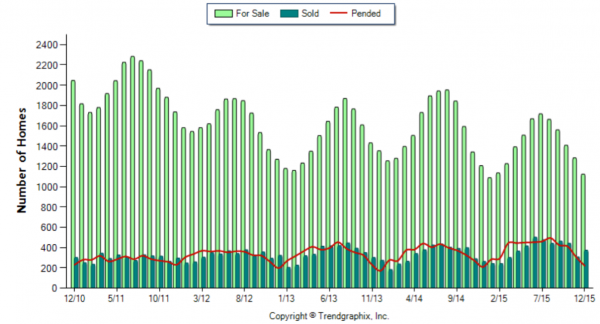 The buyer demand is a little more consistent through the year, and really starts to take-off in early Spring when the peak “homes for sale” inventories are still many months away. There are also many buyers that get through the month of August and still haven’t found a property that fits their needs at a price they’re comfortable with. Unsuccessful Sellers Have Left the Market – Many sellers give up after the month of August has past. They often over-estimate the impact that the starting school season will have on sales. The result is the number of homes that buyers have to choose from steadily declines through the fall and winter. 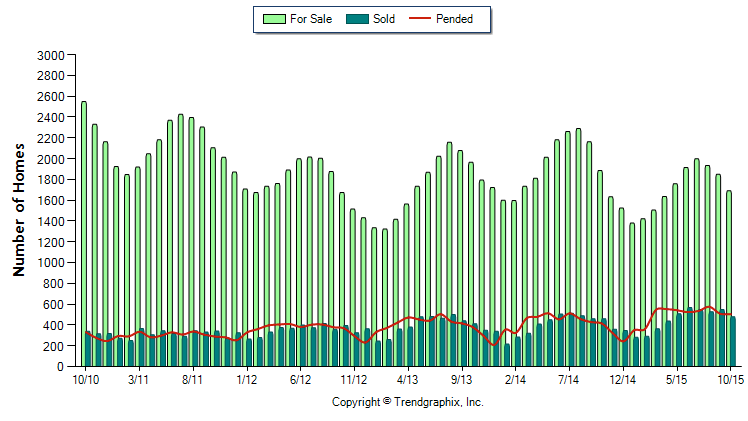 These sellers are loosing sight of the metric that really matters…and that’s the ratio of buyers to sellers. Not the total number of buyers. Fewer “New” Listings to Compete With – Well-priced listings have their best chance of selling in the first few weeks of the listing. The “launch.” (It always surprises us how little time most brokers spend planning the launch..but that’s another topic.) The great thing about the Fall market is that the number of new listings coming on the market is so few. 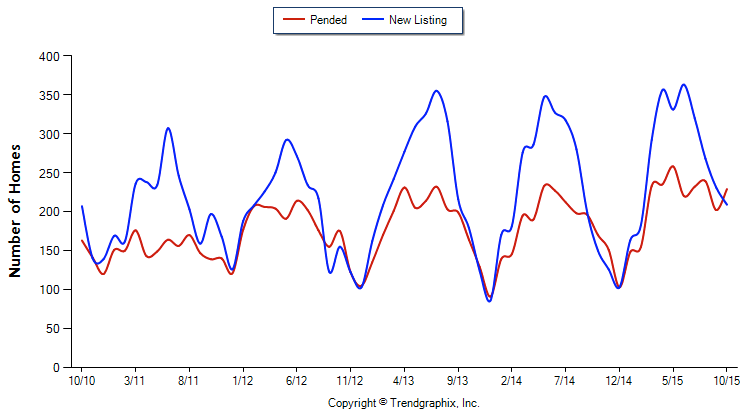 That means that new listings are getting are getting much more attention in the Fall than they would in the Summer. Getting that “page one” position on the “New Listings” sheet could make the difference. Holidays Travel Encourages Buyers – Whether people are traveling to be near family or taking advantage of time off work for a little vacation, the travel that occurs in during the Holiday season often brings up conversations about relocation. Think about the number of family meetings that occur this time of year. Moving to be close to kids, parents, friends, recreation, all come up in these friends and family interfaces. New people are coming to your community from far and wide, and at some point they’re going to picture themselves living there. Not having your home on the market would be kind of ridiculous, if you wanted to sell. After the turkey settles and the shopping is done, we get a lot of calls from visitors in Bend that had no intentions of relocating until a conversation that occurred during their recent visit. For those that want to get the best pricing from their sale, sometimes it pays to go against the herd. The first step is to look at the active available homes in your price range here. Then you can decide how much advantage you have by choosing to market right now. Kerry O'Neal provided valuable insights and expertise during our home purchase. - Ken H.